We value independence. Mobility. Self-sufficiency. Yay. But we are a dependent people. Dependent on air, food, water. Needful of others. Needful of God. He is our divine helper, our ezer, without whom we will not be able to live a life of meaning filled with what matters most. Truth. Beauty. Goodness. Love. How do we get our thirst quenched when we are unable to quench it ourselves? How do we care for ourselves when we are unable to move? How do our needs get addressed when they are too deep for us to tend? We need God. Realizing that we need Him is a profound, humbling, and extraordinary gift—the first step toward a wholeness of soul. Because when we turn to Him, we find Him. When we call out to Him, He answers. When we cry, He comforts—not merely or even primarily in the tangible and immediate way we may yearn for, but more often in a deep, steadying encounter that becomes clear only as the moment has passed. We are not alone. We are not orphans left to figure out life by ourselves. We are dependent on our God who is with us. Do you think that maybe God loves it when we realize this? Don’t you love it when someone you love needs you? I believe God enjoys it when we call out to Him, recognize that we need Him, and lean into His unending, grace-filled strength. Want more? 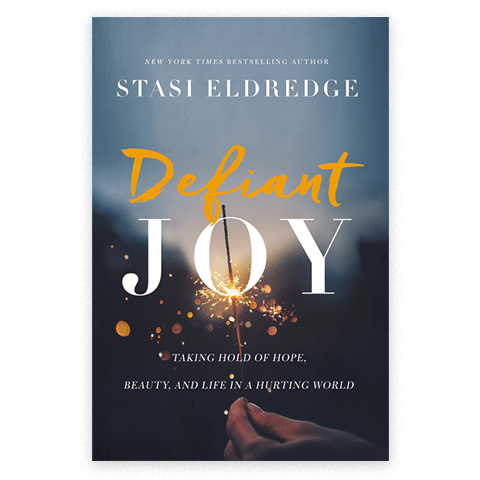 Pre-Order Your Copy of Defiant Joy Today!